Rec Tec launched a new line of grills in 2018 and retired the iconic, bright red RT-680 and the Rec Tec Mini RT-300. The new products include three pellet smokers, a pellet grill and a propane fired wok style cooker. Let’s review what you get with each of these new products and see if any of these are right for you. Rec Tec Grills was founded in 2009 by Ray Carnes and Ron Cundy in Augusta, Georgia. They started out by creating and selling premium pellet grills and have grown the company to the point to where they are selling around 250 grills per day during peak seasons. By all accounts the owners can be described as “highly passionate” about the brand. This passion is a double edged sword. On the positive side, when you buy a Rec Tec you get a card that has the owners personal cell phone number so you can contact them if you have ANY problems or questions. These guys make a great product and they want to make dang certain that you enjoy it. On the negative side, getting the honest low down on how these grills perform in real life is challenging as many people report that the owners do whatever they can to hide negative comments about their products. As an example, there is a Facebook group for Rec Tec owners who have been banned from the official Rec Tec Facebook group because they posted something other than praise. Check out the Banned from Rec Tec Grill Owners group, which currently has 732 members, for more information. The Rec Tec Bull RT-700 is the upgraded replacement for the iconic RT-680 that made Rec Tec famous. The Bull has a proprietary PID temperature controller that can dial in a temperature and hold it there within 5 degrees. The internal components of the Bull are 304 stainless steel and there is plenty of beautiful stainless on the exterior as well. Probably the most famous part of this grill are the micro polished stainless steel horns on the front of the grill. Here is a little video walk through of the Bull. Cooking Area: 702 square inches on primary grate. 352 square inches with optional secondary grate. Better warranty (6 year warranty on the 680 required $99 payment in years 4-6). The Stampede is Rec Tec’s first mid-sized pellet grill. Here is the best video that I could find for this grill. Cooking Area: 592 square inches on primary grate. 180 square inches with optional secondary grate. The Stampede is an interesting looking grill. The grill has an octagonal shape which should give it more internal volume than a traditional rounded off pit. I am assuming that this feature is to make sure you have enough vertical space for something like a beer can chicken or a large turkey. An important detail about this grill is that the warranty has been lowered to two years. This grill has the same controller, ceramic igniter and stainless steel construction as the Bull so it is unclear why the warranty is three times shorter for this model. The Silverbac from Grilla Grills is a close equivalent to the Stampede and has a four year warranty. The Stampede is a “family sized” grill and should meet the needs of most people. The Bull is a massive and impressive grill but most folks aren’t going to need something that size. The Stampede looks like the sweet spot from a size standpoint. The Trailblazer RT-340 is the upgraded replacement for the Rec Tec Mini RT-300. Here is a great video walk through of the grill. Cooking Area: 340 square inches on primary grate. 171 square inches with optional secondary grate. Again, it is important to note that warranty on this grill is only for two years instead of the six that comes with the Bull. The Trailblazer is a “tailgater sized” grill but can still easily handle three slabs of baby back ribs without using rib racks. 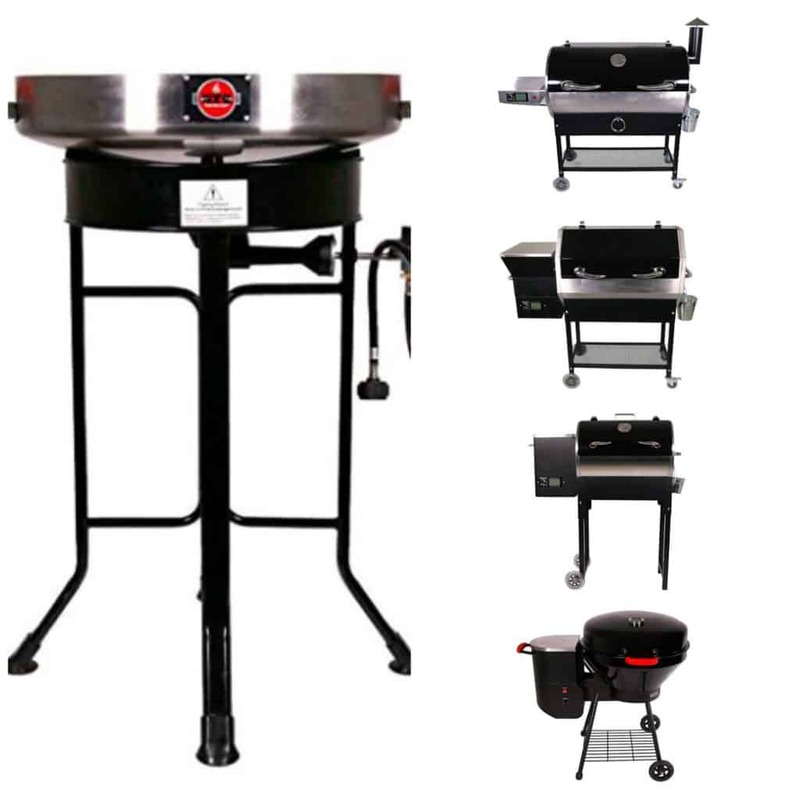 The Bullseye is an interesting grill that is a clear departure from traditional pellet smokers. The Trailblazer looks like a kettle grill and is meant to get people to swap out their gas or charcoal grills with pellet power. Here is Steve doing a walk through of the Bullseye. He shows a lot of the features in great detail and is worth watching. The core concept of this grill is that it is as easy to use as a gas grill but has wood fired flavor. This grill gets up to 500F in a little under 10 minutes and is entirely pellet fired. I haven’t used a Trailblazer and I have to admit that I am not tempted to buy one. My concerns about this grill are a combination of design, quality and cost. Design: There is no place for grease to drain out of this grill. Go back to the video above and start watching at the 3:15 mark. You are going to have an accumulation of grease right beside the open flames of the fire pot. This seems like the perfect combination for starting a grease fire. Quality: Rec Tec wanted to make this grill affordable so the replaced their state of the art PID controller with a funky manual controller where you adjust the pellet feed rate. You can not dial in a temperature. There are not even any temperature settings on the dial. My concerns about the controller are compounded by the fact that this grill is only covered by a one year warranty. Cost: The Bullseye, with its manual feed control and one year warranty, costs the exact same as a two burner Weber Spirit II E 210. The Weber Spirits are incredible grills with even heat, almost no flare ups and are covered by a ten year warranty on all components. I like the idea of the Bullseye and look forward to seeing how the design evolves. By the way, even though I am not a fan of the Bullseye, Steve really likes his. Here he is using the Bullseye to smoke some baby back ribs. The Matador is the wild child in the Rec Tec line of grills. This is actually a propane fired wok cooker and it looks like a blast! The Matador is fired with a nine inch, 20,000 btu burner that heats a 22 inch stainless steel wok. The wok has a three inch lip that really adds to the versatility of what you can do with this grill. The Matador is collapsible, comes with a carrying bag and weighs less than 40 pounds so it is easy to take this thing to a tailgate party. Here is a look at the Matador in action making some bacon fried rice. This would be so much fun to use! Should You Buy a Rec Tec Grill? I think that if you buy a Bull, Stampede or Trailblazer that you will love your grill. There are a ton of features and the grills are well built. These are some of the nicest pellet grills available. The big question comes down to your budget. When you buy a Rec Tec you are paying for a lot of features that are nice but not really needed. 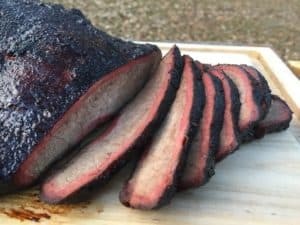 The PID controller is awesome but you don’t really need to control your temperature to +/- 5 degrees to make great barbecue. The WiFi control option is sweet but you don’t need it to make great barbecue. A 40 pound hopper capacity is awesome but it isn’t that hard to add more pellets. Micro polished stainless steel horns look great but don’t help your barbecue. It really comes down to are you a budget based value shopper or do you want all of the bells and whistles. And that, my friend, is completely up to you. If budget is a concern then you might be able to make these work for you through their six month financing program. To learn more about these grills you can do a some more research at the Rec Tec website.